Hizb ut Tahrir / Wilayah Sudan, under the leadership of Ustaath Nasser Ridha, Head of the Central Contacts Committee, accompanied by Ustaath: Abdullah Abdulrahman – Member of the Council of Hizb ut Tahrir/ Wilayah Sudan, Abdullah Hussain and Abdelkader Abdul Rahman – Members of the Central Contacts Committee. 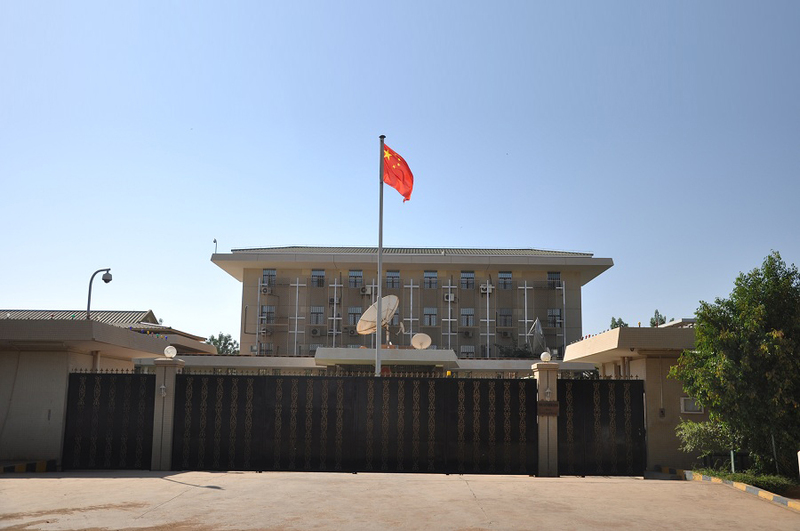 The delegation handed over to the Chinese Embassy in Khartoum a press release issued by the Director of the Central Media Office of Hizb ut Tahrir, Dr. Osman Bakhach in Arabic, English and Chinese, entitled “Khilafah will Liberate East Turkistan And will Free the Uyghurs from China’s Criminal Oppression”. The delegation stressed the delivery of the statement to the Chinese government, to lift its hands from our Muslim brothers and sisters in East Turkistan. The introduction to the press release stated the following: “China’s criminal leaders were encouraged by the meek response of the rulers of Muslims; who preferred the dollar deals than supporting the Muslims in East Turkestan as evidenced by their deafening silence against the horrific crimes of the hateful Chinese authorities in their desperate attempt to isolate Muslims of their Deen, the Deen of Islam that has filled their hearts with passion since their ancestors were guided by its light, and embraced its creed in the late first century of Hijra (immigration)”. The press release also pointed out the tragedies of our Uyghurs brothers and sisters in East Turkistan, citing some of the media and human rights organizations, where it stated as follow: “Intelligence Magazine has published China’s announcement that Islam is a contagious disease that must be treated in every way, even through torture and murder. Human Rights Watch reported that the Chinese authorities are forcing Muslims to renounce Islam under threat of psychological and physical torture. The Chinese authorities claim that they are forced to confront the triad of evil: terrorism, extremist ideology and the call for secession, as the BBC reported. Under these false slogans the Chinese authorities use various repressive practices. While the Chinese authorities carry out all these campaigns, they see from the rulers of Muslims nothing but disregard and complicity”. The press release concluded with: “Muslims will not forget about the injustice, the current crisis they face is a passing summer cloud. The Khilafah Rashida (rightly guided Caliphate) on the method of Prophethood, which will come soon, by Allah’s permission, will bring the victory to our oppressed brothers in East Turkistan, and will hold accountable all who oppressed them and stood against them, the Prophet ﷺ said: «إِنَّمَا الإِمَامُ جُنَّةٌ يُقَاتَلُ مِنْ وَرَائِهِ وَيُتَّقَى بِهِ» “The Imam is a shield, behind whom you fight and protect yourself”. And then neither China nor others dare to hurt a Muslim because they realize that whatever they do will be brought back to them doubled. And Allah is the Strong and Powerful”. Previous PostQ&A: Seeking the Nusrah and in Which Stage is the Party Now?